Cook ground beef in a skillet over medium heat until browned. 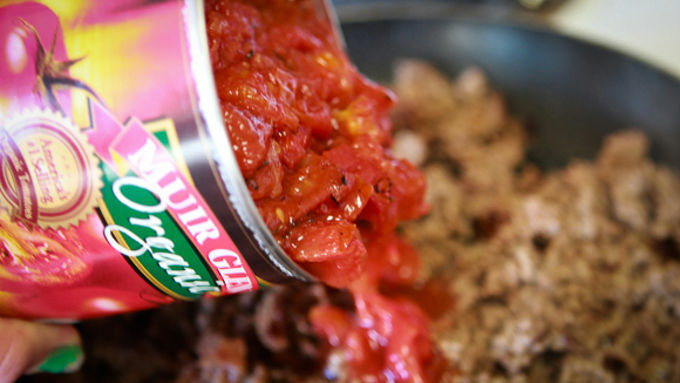 Add fire roasted tomatoes and Old El Paso™ Taco Seasoning Mix. Set aside. 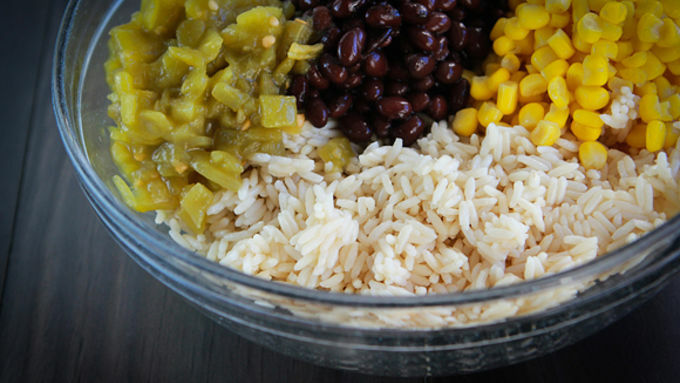 In a large bowl, combine the corn, black beans, green chilies, 1-1/2 cups of sour cream, and rice. Spread half of the rice mixture into the bottom of a greased 9x13 inch baking dish. Spoon half of the tomato mixture on top, then spread a second layer of rice, and a second layer of the tomato mixture on top of the rice mixture. 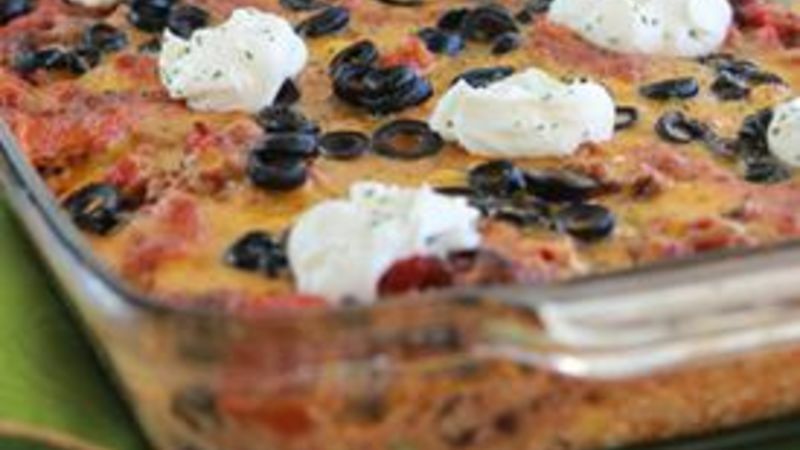 Top with cheese and olives. Bake in preheated oven for 20-30 minutes, or until cheese is bubbly. Cool slightly before serving. Serve with a dollop of sour cream and a sprinkling of cilantro flakes, if desired. 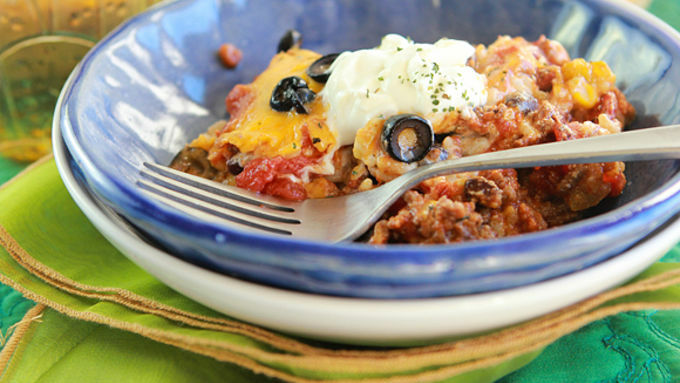 Warm up yer bones with this Mexican twist on a comfort food favorite! Layers of rice, taco meat, and pure scrumptiousness come together all snappy like in this easy dish. Here's how it works. Autumn creeps up all colorful and fun like. Then one day you wake up and it's the bitter dregs of winter. You're cold to the marrow and not a thing can comfort you. Snuggies don't stand a chance. Running up the water bill and living in hot baths may be the only option. At least, that's what you think until you nab yourself a copy of our tres perf recipe for this Mexi-Rice Bake. Just enough spice to heat up yer gut, just enough heat to warm body and soul. Winter. It's a good thing. But don't try to survive without Mexi-Rice Bake. The end. 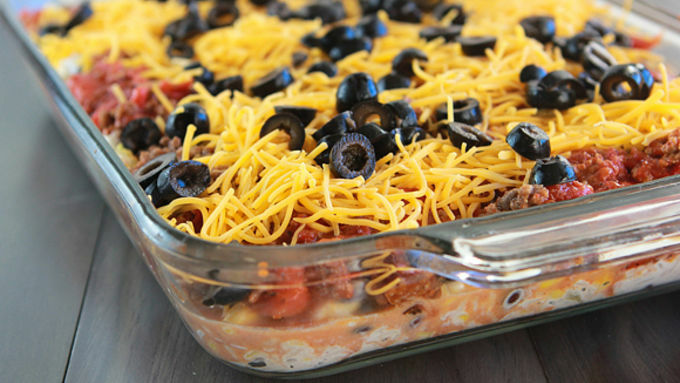 Wanna make this incredibly delicious comfort-food bake? It's easier than you think and makes a pan full. So one night of cooking will feed a whole room, or a single body until the groundhog saves us from this chilly weather sometime mid-February! Throw off your woolen socks, toss aside your snowman sweater. Grab a spoon. This hot dish is all you'll need to stay warmy and smarmy this winter. Well, that and the occasional hot buttered rum. But, let's keep it simple tonight.